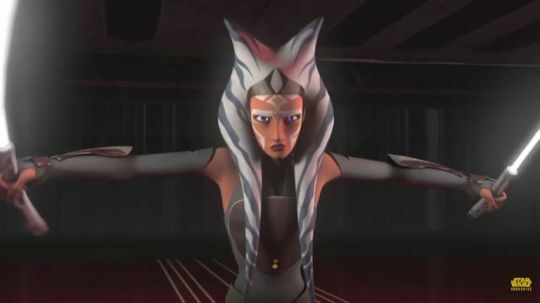 In Part One, we addressed the likelihood of Ahsoka Tano being killed off in the season finale of Rebels. Now in Part Two, we will take one more look at what lies ahead in that finale via the scenes shared from the mid-season trailer shared earlier this winter. 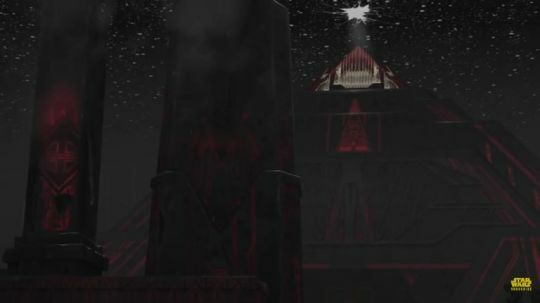 We know that Kanan, Ahsoka, and Ezra will be heading to the planet Malachor, which in the old Expanded Universe served a critical role in the history of the Sith, and in the current Expanded Universe, is place equated to our own Hell. 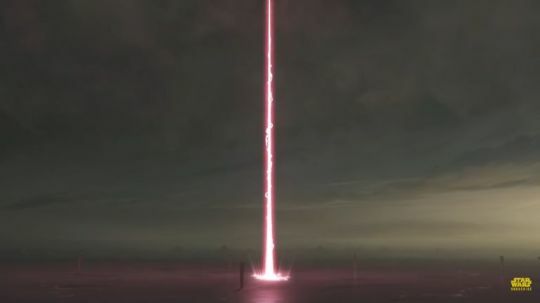 It is to this place that Yoda told Ezra that he must go, if he is to find the solution to overcoming the Inquisitors, and it will almost certainly serve as the setting of the Rebels’ season finale. For those who have already explored the trailer frame by frame, much, if not most, of this will be familiar, but let’s take a glance at all one more time. This first image probably comes much later in the finale, but it gives us an idea of what the surface of Malachor looks like: a desolate unending plain interrupted only with the ruins of a world long dead. 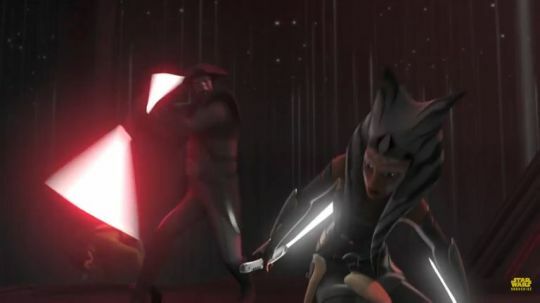 You can see some of this in the background of the chronologically first frame, which shows Kanan, Ahsoka, and Ezra, approaching some kind of obelisk or ruin. 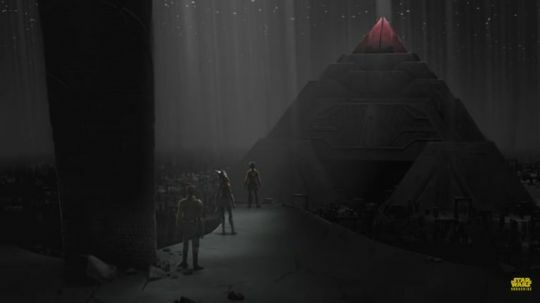 Against Ahsoka’s warning, Ezra touches the monument, causing a reaction. That reaction quite likely opens a pathway under the surface and into a vast cavern containing a Sith temple. The area surrounding the temple is surrounded with what have been aptly described by others as something similar to the remains found in the ruins of Pompeii, people or at least their impressions, frozen in time in the aftermath of some incredible disaster. 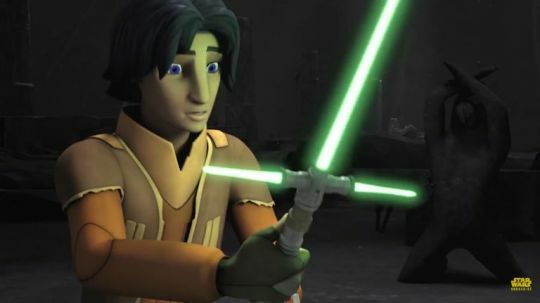 Amongst the dead, Ezra discovers a lightsaber which echoes the design of Kylo Ren’s lightsaber in The Force Awakens, a blade with a crossguard or quillons, which as we know from the Visual Dictionary for The Force Awakens is a design which originated from the time of the ‘Great Scourge of Malachor.’ In a bit of a connecting the dots within the Expanded Universe, this helps to establish that Ren might have visited Malachor years after our rebels. At this point, either the Inquisitors show up or they don’t and by Inquisitors, we mean three of them, not two. It appears that Rebels will introduce a fourth Inquisitor (this includes the Grand Inquisitor) for our finale and Ezra ends up facing off against this new mystery antagonist. Regardless of when they show up, the face off looks to appear outside the temple. This is our best view of the new Inquisitor. 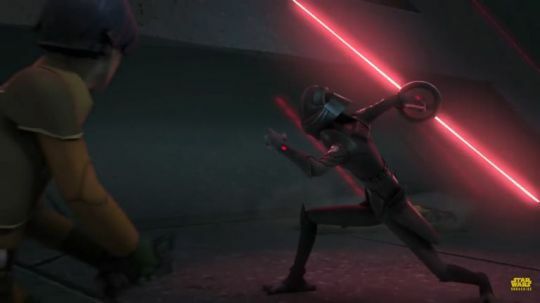 If we go off body shape and style of the Inquisitor’s pauldrons and compare them to the Seventh Sister’s, it seems likely that this Inquisitor will be another ‘Sister.’ But, nothing is for sure until we see the episode. 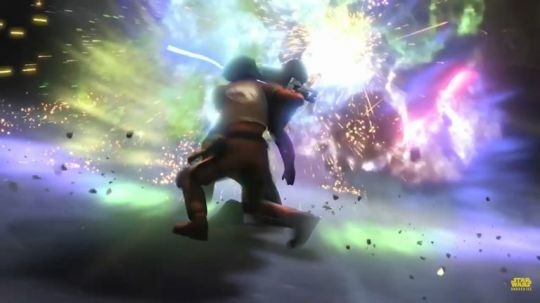 As part of this fight, one of the original deceased in the battle, apparently provides Ezra a little cover from a bit of an explosion. 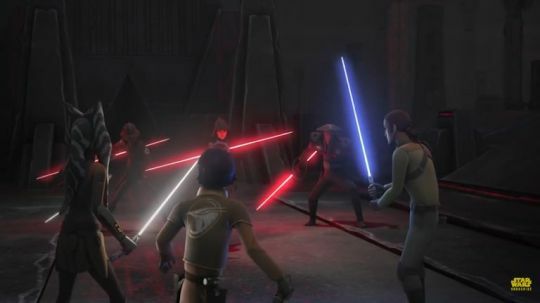 It’s important to point out that either this fight with the Inquisitors moves around a lot within the setting of the temple or there are at least two different clashes between the Jedi and the Inquisitors. This is supported by the change of the floor, as there’s a floor outside the temple and then there’s a much glossier floor for inside the temple. 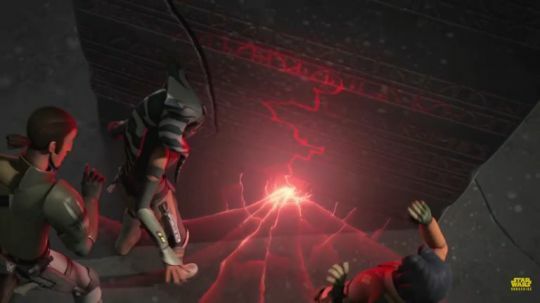 During the first fight, it’s possible that Ezra gets separated from Kanan and Tano, and finds himself unknowingly in a chamber where a Sith holocron is located. Let’s pause a moment to consider what’s happening with Ezra in this moment. Unintentionally or not, Ezra is in the midst of pursuing forbidden knowledge on his quest for power. 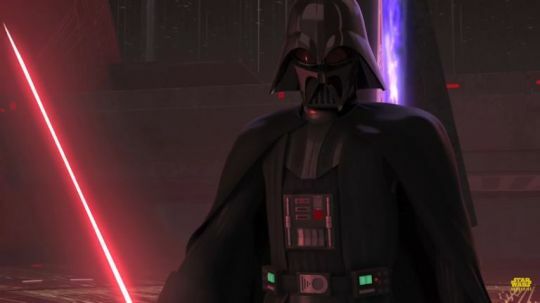 Power has long been a path to the Dark Side and as Yoda warned Luke in The Empire Strikes Back, it is a quicker path to power than the Light Side. Hence, it’s allure. 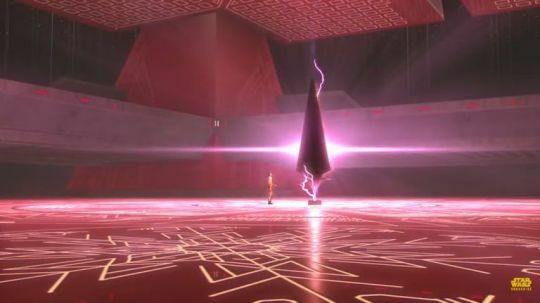 On this path or not, Ezra ends up awaking something in the temple in the process of discovering the Sith holocron, which sends power throughout the temple and shooting out the top of its pyramid-like top. 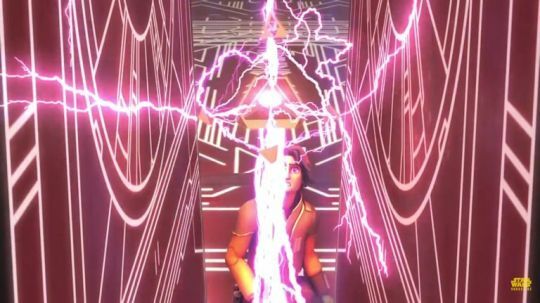 Once this Sith temple ‘power up’ is complete, Ezra ends up taking the Holocron (or his taking leads to the power up). 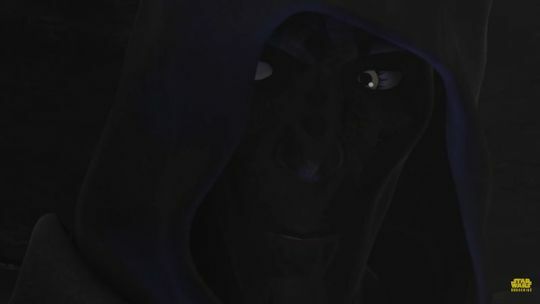 This leads to a potential vision of a familiar Sith from the Prequel Trilogy or his actual premiere on Rebels. Of course, this is Darth Maul, looking arguably better than we last saw him in The Clone Wars, but that’s not really saying a lot. 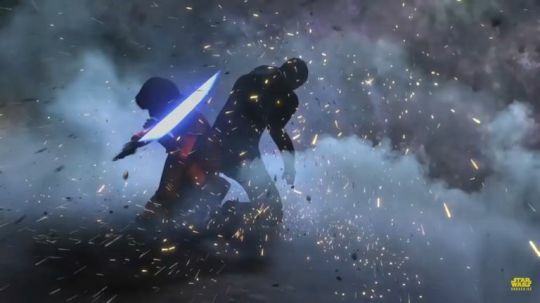 Ezra, to his credit, appears to hold Maul at lightsaber point initially, but as we then surprisingly (and worryingly) see, allows Maul to appear to comfort the young padawan. 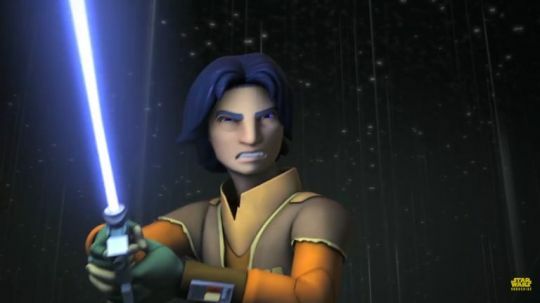 This leads us into one of the biggest mysteries that won’t be answered until we see “Twilight of the Apprentice,” what will come of Ezra’s encounter with the slayer of Qui-Gon Jinn? Rumors floating about the Internet indicate Maul will actually help Ezra in some form and perhaps this is true, as one cannot believe Maul is a big fan of the Emperor or his servants after his own fate. 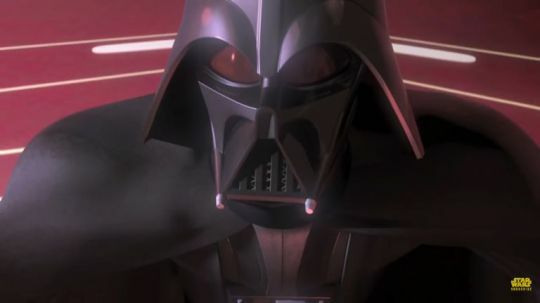 But, at the same time, he is a Sith, after all, and they rarely act with virtuous intent. 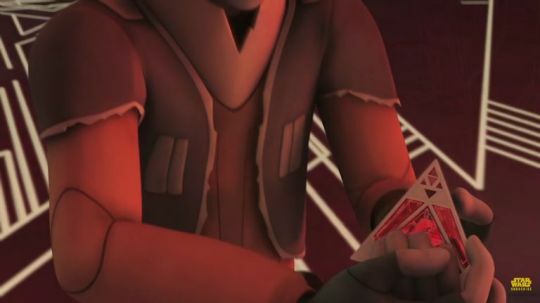 One point to consider, however, is the title of the season finale, “Twilight of the Apprentice.” Of all the Force users present in this episode, Maul is the only one to actually be referred to commonly as “Apprentice.” Perhaps the title implies the fate of Maul, rather than our two current and former padawans, Ahsoka and Ezra. 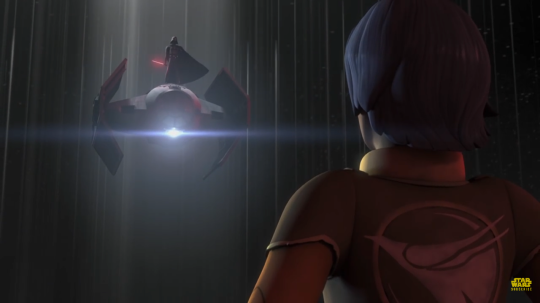 Regardless of what happens, Ezra continues onward to confront Darth Vader. He arrives on the top of his personal TIE Advanced and promptly lands before Ezra, lightsaber at ready. 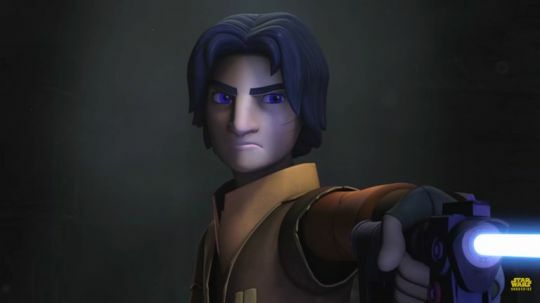 Ezra’s response is interesting as he almost snarls as he prepares to fight the Sith Lord who soundly defeated him and Kanan in “The Siege of Lothal.” We can only assume that Ezra believes himself now powerful enough to take on the Emperor’s right hand. We know he isn’t because Vader ends up fighting someone else other than Mr. Bridger. 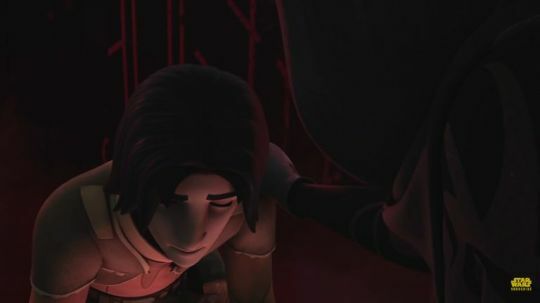 Whatever happens to Ezra, we know he survives his encounter because we know he will return in Season Three. What we don’t know is whether he survives the encounter (or even before this moment) and avoids the seduction of the Dark Side. Elsewhere, our other Force users are engaged again with the Inquisitors. 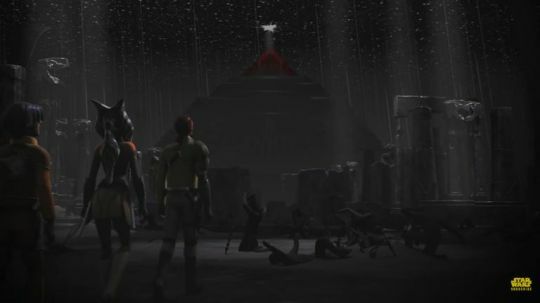 In what we did see, the fight is now within the temple and it at least involves the Fifth Brother, Kanan, and Ahsoka. 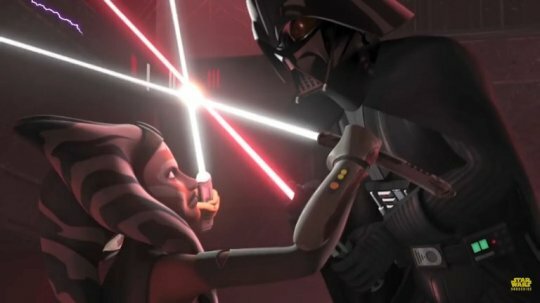 At some point, either the Fifth Brother is defeated or Ahsoka separates herself from the fight, which leads to the final confrontation between her and Darth Vader. 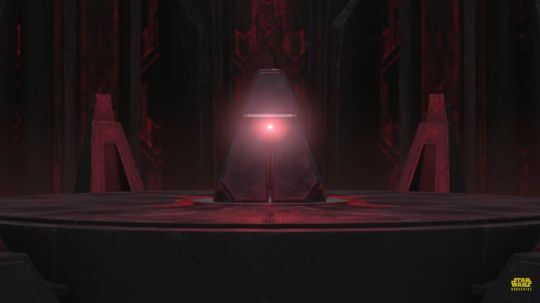 It takes place in something that might be the center of the temple, given the black obelisk-type thing which may or may not also be some sort of power conduit to whatever Sith energy flows make the temple hum. 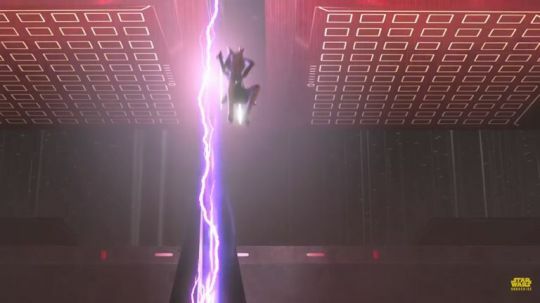 Ahsoka at the beginning of the fight or in the midst launches herself in front of it on her attack against her former friend and mentor. 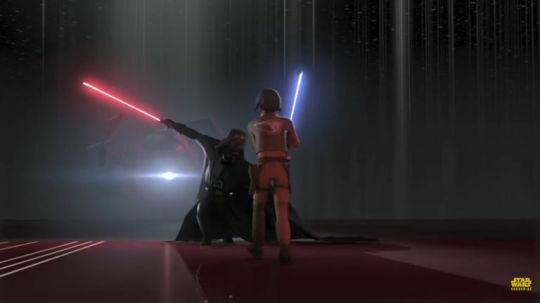 March 14, 2016 in Star Wars Rebels. Tags: Ahsoka Tano, Anakin Skywalker, Dark Side, Darth Maul, Darth Vader, Ezra Bridger, Fifth Brother, Fourth Inquisitor, future recap, holocron, inquisitor, Jedi, Kanan Jarrus, power, Rebels, Review, season two, Season Two finale, Seventh Sister, Sith, spoiler, spoilers, Star Wars, Star Wars Rebels, Star Wars Review, Star Wars theories, The Clone Wars, Twilight of the Apprentice, Will Ahsoka Die?, Will Ezra Succumb to the Dark Side?